Pope: Sometimes Marital Separation 'Morally Necessary' : The Two-Way Francis, speaking during his weekly general audience, said couples splitting may be needed to protect "the weaker spouse" and children. 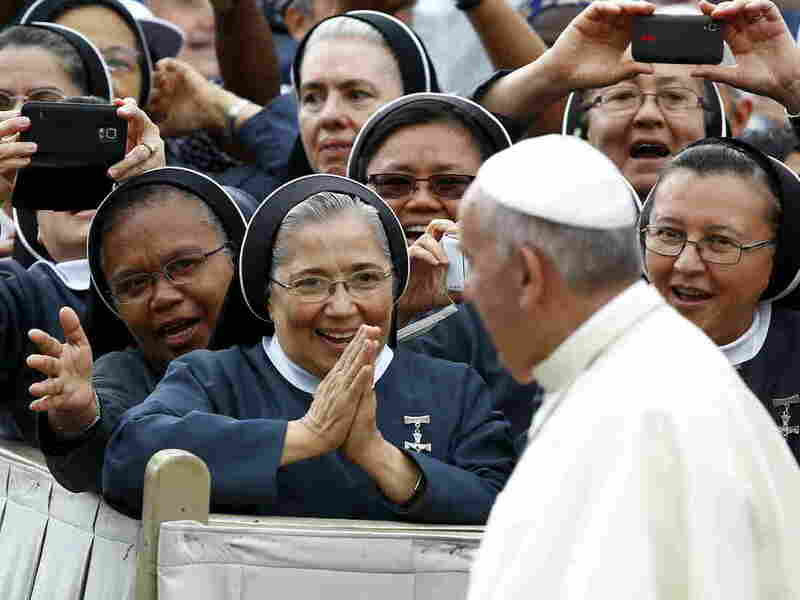 Nuns greet Pope Francis as he arrives to lead the weekly audience in Saint Peter's Square at the Vatican on Thursday. The pope, speaking at his weekly general audience, said sometimes separation is "morally necessary." Pope Francis, speaking on family issues, says that sometimes marriages are so damaged that it is "morally necessary" for a husband and wife to separate. "There are cases in which separation is inevitable," the pontiff said at his weekly general audience. "Sometimes it can become even morally necessary, precisely when it comes to subtracting the weaker spouse, or small children, from more serious injuries caused by arrogance and violence, by humiliation and exploitation ... and by indifference." "Let us ask the Lord for a strong faith to see with his eyes the reality of family life, and for a deep love to approach all families with his merciful heart," he said. The Associated Press notes: "Francis has been making a series of statements about family issues ahead of a much-anticipated October synod, or meeting, of bishops to address the topic. The bishops will take up many issues, including how the church can be more welcoming to divorced Catholics who remarry without going through the church process that declares their first marriage null." The church has long said that divorced members cannot participate in communion. Time magazine writes: "There's no precise estimate worldwide, but according to Georgetown University's Center for Applied Research in the Apostolate, some 4.5 million Catholics in the United States (alone) are divorced and remarried without an 'annulment,' a declaration from a church court that the first marriage was invalid." In December, speaking in an interview with the Argentine newspaper La Nacion, Francis said the church must consider ways to integrate divorced and civilly remarried people."